When it comes to books and reading culture, South Korea has many reasons for pessimism: Book consumption is at a 10-year low and only 35 percent of Korean adults finish a single title a year. But this does not mean that there are no avid readers here. On the contrary, a trend is emerging among local bookworms, with book clubs and community-oriented independent bookstores connecting readers. Trevari is at the heart of this trend. The venture organizes and manages book clubs for a four-month fee of 190,000 won ($170). It started out with just 80 members in 2015 and now has more than 1,600. “I feel like I am spending my time and money right, productively,” said Cho Hyung-mo, 35. Yang Sung-hoon, a Trevari member since last year, said book clubs offer an opportunity to enrich one’s reading experience. “I enjoy intellectual conversations (with other members) about a book, because I know I will get quality responses from them,” he said. The touted benefits of joining a book club vary. They include getting help in finding out the current best books; establishing regular reading habits; meeting intelligent people from various fields; and building confidence in discussing various, sometimes very profound, issues. Businesses -- not just those in the publishing industry -- have been quick to respond. 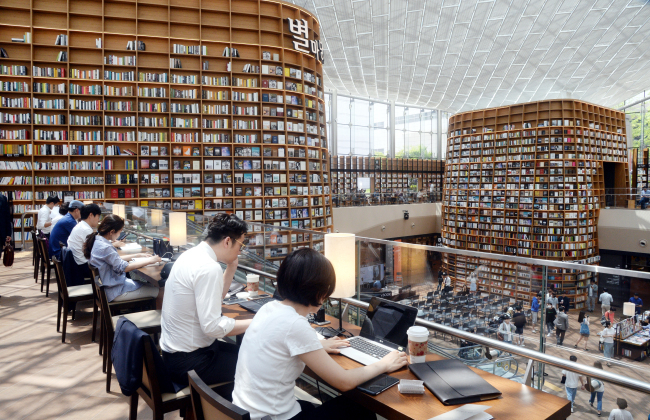 With the emergence of “readingtainment,” a Korean term that combines the words “reading” and “entertainment,” shopping malls have started to build magnificent libraries to attract visitors. This 2800-square-meter space holds central bookcases that reach two levels of the mall and offers plenty of seating. People are even allowed to eat while reading. Book curator Oh Seo-hyun sees the latest trend as a positive development in the country’s reading culture, although it may not necessarily lead to a major turnaround in the sluggish book market in the near future. Once a solitary act, reading is becoming trendy, said Ahn Won-kyung, manager of trend tracking company Stylush. Large bookstores are also catering to this new breed of readers. Last year, Kyobo Bookstore, the largest in the center of Seoul, did away with some bookshelves and instead brought in long wooden tables for people to sit down and read. Kim Seok-hwan, CEO of the biggest online bookseller Yes 24, said the emergence of book clubs and small bookstores has showed him how his company should evolve.